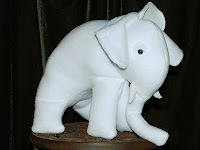 There's a story about me and a giant white elephant that my (step)mother liked to tell. Depending on my stage of life, I've listened with different degrees of grimace. It has become one of those family myths that supposedly defines a personality. I remember this well. We were at my grandparents' for Sunday dinner. I was four or five. The elephant was plush, white and wore some sort of embroidered saddle. It was nearly as large as I was, and I wanted to get it across the room. The grownups were at the dinner table, and I really, really needed help. Or someone to do it with me. Or for me. Whatever. "Ha, ha, ha," the story always concludes, "there you were, crying for someone to carry that giant stuffed elephant across the room, saying, 'I can't do it, I can't do it,' and all the while, you were doing it." Now I’ve always heard this story with some degree of humiliation; but depending on my decade or stage in therapy, it’s had different meanings. For years the meaning was, Listen to how my (step)mother likes to humiliate me with this story; wasn’t she mean, weren’t they all mean, to just watch poor, motherless little Hope struggle to carry the giant white elephant across the room? Why didn’t they help her? A later version, more evolved, went like, Listen to the subtext of this story: poor, motherless little Hope could carry the elephant, but she didn’t realize she could, and she really, really wanted someone to help her, so she wouldn’t have to do it alone. They, the mean grown-ups, thought it was more important for her to realize she could do it on her own than to give into her wish not to have to. Perhaps the most evolved version is, Look at the situation. The poor old grown-ups are exhausted, they just want to relax and enjoy a dinner someone else cooked for them, and the last thing they want to do is get up out of their dining chairs and help that annoying, perpetual-motion machine known as Hope drag yet another goddam toy out into the living room. 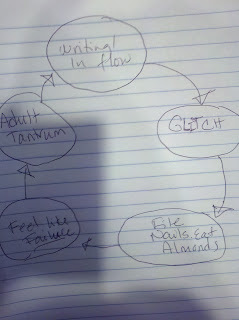 I thought of the story the other day when I came across a diagram I drew in my Success notebook (more on that later). Okay, so there’s my creative cycle. Any one segment of it can last from hours to months. The gist of it is, though, that despite how I flail, I do get back to writing eventually. It’s just part of the cycle. If my tens of readers harken back to when I began my blog, you may recall I was in the middle of a novel. I have been in the middle of this novel for a long time. I’ve been in the middle since before we moved out of NYC, since before we had to make our final, unexpected move within NYC, for over three years. I’m having a problem with the voice. A problem with my protagonist. I also ran into a problem with the plot when the housing market imploded. Glitch city. So instead of working on it, I’ve written other things, tried to get paying work, and started this blog, when I was feeling really, really bad about everything. 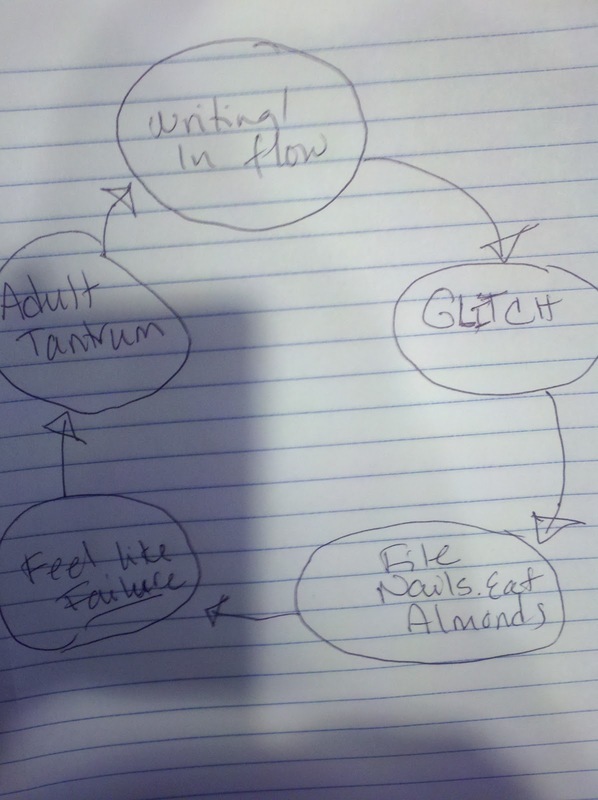 When I looked at that creative cycle diagram in my notebook, it occurred to me that this whole Success/Failure thing I’ve been writing about here is one gigantic tantrum. A productive, entertaining and engrossing (I speak only for myself here) one, but a tantrum nonetheless. A gigantic wail that starts out as “I can’t,” morphs to “I don’t want to,” moves to “but I do want to and I am allowed to want to,” and will eventually end up back where I began, revising my story. Do you know what this means? It means that my (step)mother was right. My stepmother was right? Well, I don’t have to tell her. Luckily for me, she’s developing Alzheimer’s. Which means, I guess, that if she remembers to tell me the elephant story one more time, I won’t hold it against her. I can do it. I am doing it. Every moment that I think I can’t do it, I am doing it. Carrying that freakin’ elephant across the room. Wow! Excellent post. It is amazing how we see our childhood pain in a new light once we're adults. Sometimes, the actual pain isn't caused by what the story was about but who was in the story. Which makes it interesting how the painful traits of the characters never actually change. Good luck with your novel. Good luck with your changes in life. I know how they can overcome everything else. Hey thanks, AL! I appreciate the comment. Stepmom baggage. Only I'm on the other side of that, being the stepmom who raised two daughters from ages three and one. Interestingly, my (natural) daughter—not to imply the older two were unnatural—has as much baggage about her childhood. I feel unkind even labeling it baggage. I am not judging. It's just stuff we carry with us throughout life. It's a good thing when we can unzip the suitcase and re-examine the contents in a different light. You started your blog at the depths of your despair. That is a very courageous thing to do, from the perspective of someone like me who tends to clam up during crisis. Please do continue to write, as you are one of the rare bloggers I actually respect and value for your introspection, self-reflection and masterful command of the language. You have no idea how I die a little inside every time I peruse blogs that offer nothing but the equivalent of reality TV. P.S. I shared a link to your post on my Facebook page. Scrollwork, Thanks so much for your comment. It really made my day/week. I have a lot of respect for stepmothers. There's a big topic. I don't think mine did it very well at all, but I've seen enough friends manage the role with grace to know it's possible. It's good to feel heard, isn't it? I completely understand how these childhood stories can live with you - and how the perception of them changes over time. Can even take on different meaning from what the person telling them intended. I have a few of those in my life. As I read your elephant story the first thing that struck me is that even as a child, you had more strength and more determination - that you have always been more formidable - than you've ever given yourself credit for. I think this clearly shows itself in your creative cycle and in the way you've stuck to your writing. You may question your abilities and strength as a writer, but you don't stop writing, at least not for long. Writing is your white elephant and you are pulling it along, getting closer to your goal, no matter how much you question whether or not you can or should be doing it. It's funny how we can see ourselves so differently from how the world sees us, and how we can, at times, underestimate ourselves. My first impressions of you were of someone strong, determined and capable of things that lesser people would shy away from. This elephant story affirms my impressions - you are a force to be reckoned with! Anyway, I'm totally blown away by your impressions of me. Your first impressions, that is. I don't see myself that way, but it gives me a boost to know I may come off that way, at least at first. It's so helpful to see how you come across to others. I remember my first Back to School Night when I was a teacher. My God I was so nervous. Afterwards, several people told me how calm and collected I'd been. It was a total confidence builder. I realized I could just go ahead and be nervous, but I didn't have to worry that I'd seem that way. Julie, are you still blogging? Your blog hasn't been active in a while.